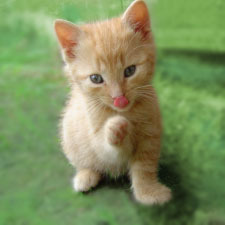 Sites We Like < Greener Cats in 2012! New Year’s Resolutions. We’re full of them. But how many of us have resolutions for our cats? One of our latest favorite websites called GreenLittleCat.com, is a blog dedicated exclusively to sharing ideas on greener living for cats and cat lovers. Encouraging their readers to take a 30-Day Green Cat Challenge, this website is there to help you and your cat go green in a month! Just one day at a time, tackling one aspect each day, you can transform your kitty into an eco-friendly pet. There’s a task assigned to each day and even a daily green inspiration to keep you going. Every single one of us can make a huge difference when it comes to the environment! So whether you accomplish all 30 Challenges or just one, you and your feline friend will be greener. Now that’s a resolution you can keep!